It’s easy to see why this book is so highly regarded by so many people “in the know”; it feels like a model of the form, often duplicated but rarely as successful. It’s now SOP for a championship-winning team to have a book or two published about it by beat writers of the team’s local papers, but somehow those always seem like disappointments, ephemeral and utterly forgettable. Perhaps you need someone who is not associated with the game to get a true perspective, to give the game its proper scope in the social fabric. That’s where David Halberstam, reporter par excellence, comes in. That The Breaks of the Game is one of the (if not THE, full stop) best books about sports I’ve come across is me just writing blurb copy for another reissue, joining many others on the back cover that say much the same thing. Halberstam’s accomplishment here is bigger than writing well about a particular team: he’s able to take a wide-angle view of the sociological changes hurtling toward the NBA and its general inability to adapt. The rising salaries, the infiltration of sports agents, the relatively swift change from a mostly-white game to a mostly-black game, the influence of television, the rapid (and detrimental) expansion of the league, and the daily grind of the modern athlete all get explored with care and depth. It’s a portrait of a league in transition, caught between two eras and not aging very gracefully. The NBA now is a game of mini-dynasties: most teams are able to win two, if not more, championships in clusters. But in the late 1970s, following the unprecedented run of Celtic hegemony and right before the Lakers and Celtics were about to dominate the ’80s, you had teams winning titles and then burning out quickly. Halberstam is able to explain the economic realities pushing against teams’ abilities to keep title-winning squads together. The 1976-77 Blazers have been described as “the perfect team,” and the ’77-78 team was well on its way, but an injury here and a contract dispute there is all it took to render the team mediocre. We were deprived of something when that happened. What might surprise veteran readers of the “year with a team” genre is how little the author here describes actual basketball on the court. Because Halberstam was not by trade a sportswriter, his forays into basketball play-by-play, while accurate, read like an author who’s spent many hours with coaches and general managers and is now trying out the snappy vernacular for himself; it’s not hard to follow him but you can tell it’s not in his wheelhouse. Much of his narrative, probably two-thirds, is concerned with the ancillary issues that had driven the NBA by the late ’70s to an existential crisis point, and that is where his vast repertorial experience pays off. 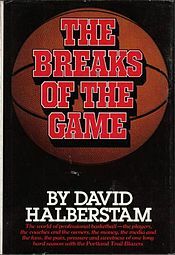 Halberstam gets all the principals to speak candidly about their situations, allowing him to paint three-dimensional portraits of the ’79 Blazers, and lends the swift implosion of the championship team a tragic grandeur. When Halberstam died in 2007, Bill Simmons eulogized him by saying he “grew up” with the people in this book, that they were so vividly drawn they felt like friends he revisits every few years. I echo his sentiment. It didn’t hurt that Halberstam had some larger-than-life personalities to work with (Bill Walton, Jack Ramsay, Maurice Lucas, etc. ), but he got some players known for their reticence (such as Kermit Washington) to open up as well. Even the team’s head trainer is given his proper place in the narrative. It’s also a trip to read a book that takes place right before the game really took off commercially. As Breaks takes place during the 1979-80 season, that means certain NBA royalty never show up: Jordan, Olajuwon, Drexler, Barkley, Ewing, etc. Bird and Magic are rookies (to hear players speak contemporaneously about what these two players might become is particularly amusing). To imagine a game as yet affected by these global players is charming, but could have made the book feel, for a reader like me born after its publication, like a stodgy time capsule, a relic. What amazed me was how much Halberstam got right about what the game was becoming, and how applicable it still is. The numbers might have skyrocketed (consider that top players in 1979 are still looking for deals in the hundreds of thousands annually; the TV networks, none too excited about the NBA, offer packages in the tens of millions), but the issues haven’t changed. Any sports fan owes it to himself to read this book, but The Breaks of the Game‘s appeal extends far beyond that.